There are two definitive things that everyone instantly knows the second they look at the McLaren Senna. Number one, it’s an extremely, face-bendingly fast car. Number two, it’s a bit unpleasant to look at. But this one, chassis number 001, is doing a hell of a good job fixing that. Now, I’m not saying it’s flawless, mind you. It’s got an incredibly dorky outline of the Interlagos race track on its face (which McLaren helpfully points out has the badge denoting the start/finish line), which is just unnecessary. Would people not see the giant wing? Would people not see how low it is to the ground? Would people not know it’s called a Senna? These are already very racy and very Brazilian things. But you know what? Besides the lack of originality, I don’t really care one bit. The L’Or Blanc is a gorgeous car, and frankly, every car should come painted like that. There’s an old Subaru SVX parked outside my apartment that would lovely in white with blue drizzled everywhere all over it. It would look like a fancy cake. And everyone loves fancy cake. The thing I love most about this particular Senna, however, isn’t the “MSO Aurora Blue” and “MSO Anniversary White” paint job. 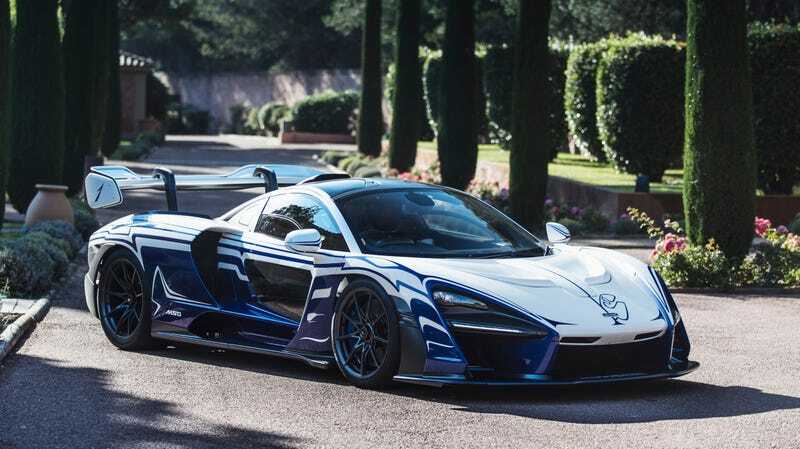 It’s that upon taking delivery, owner David Kyte immediately drove it along with three other Sennas from the McLaren headquarters to the Paul Ricard Circuit, according to a McLaren press release. Which is 870 miles away. Good on you, David Kyte, for deeply understanding that cars are meant to be driven. And for also buying the one good-looking McLaren Senna. Correction: This article originally identified David Kyte as someone who works in finance. McLaren reached out to clarify that while the owner of the Senna is a different David Kyte. Two guys named David Kyte, both of them extraordinarily wealthy. Strange world we live in.